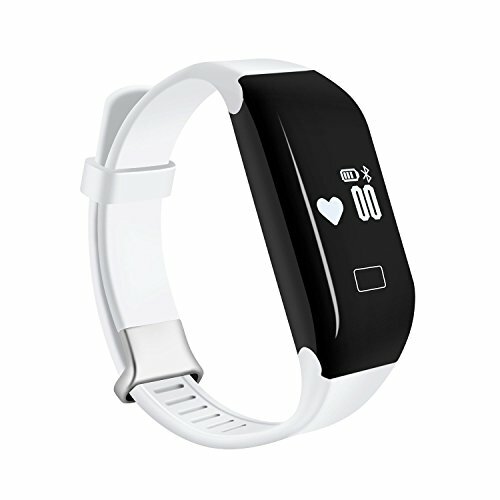 Memory:4mbheart rate sensor: PPG screen size: 0.49'' & 0.66''64 x 48, size: 220 x 23 x 11mm, weight: 30g, strap material: CPU battery:120mah polymer lithium battery Bluetooth: Bluetooth 4.0, system support: IOS 7.0 or above, android 4.3 or abovesensor:3d gravity acceleration sensor waterproof: Ipx69continous heart rate monitor:12-18hoursfunction:Walking steps: Record day walking steps walking mileage: Record day walking mileage the exercise time: Recording time your day movement consumption of calories: Displays calories you consume day sleep records: Monitoring the quality of sleep calls to remind: Important calls / SMS alert heart rate detection: Supports real-time monitoring of heart rate and electrocardiogramnote:Battery:110mahcharger time: 1-2 hours standby time: If turn off Bluetooth and heart rate, standby5 days, if turn on Bluetooth and heart rate test, the battery just can use about 2-3 hours. Please use wall charger to charge it. When you charge it, please clip the charger in right place. Heart rate: PPG, support heart rate test when having rest or sleeping. But heart rate function will use much power. So when you sleep at night, you'd better turn off the heart rate function. You can test it when you rest. Package included: 1x smart bracelet 1x USB charging cable 1x user manual note: 1.Waterproof ip67, can be used when swim or shower(up to 30min in water)2. The screen will auto light up and display time when you turn over hand, it remains black when there's no activity. If you have any questions about this product by KASSICA, contact us by completing and submitting the form below. If you are looking for a specif part number, please include it with your message.